Born in Tasmania in 1941, Helen Wheatley studied with painters Jack Carington-Smith and Rosamond McCulloch, taught art and worked as a set designer in Hobart, Melbourne and at the BBC in London. Here she was able to consolidate a long-held interest in architectural forms, learning the techniques of architectural drawing. Buildings became a natural choice of subject though she continued to study advanced life drawing, notably with Brian Carvalho in London. In 1990 Helen became a student of Hugh Buchanan at the Edinburgh College of Art, finding here the ideal combination of grand subject and inspirational teacher. She now lives in Devon and, inspired by the architecture and atmosphere, makes paintings and drawings of important buildings here and elsewhere . Helen also works as both crew and artist on traditional sailing ships and her images of life at sea are exciting some interest. 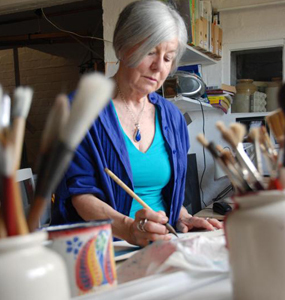 Helen is happy to accept commissions for paintings or drawings and has a range of completed work for sale at all times. Pictures vary in size from 50x30cm to 15x10cm and prices range between £500 for a framed watercolour to £15 for a small drawing. Prints of all drawings and some paintings are available at any time as well as a range of cards.